Total playing time | 42:18 min. 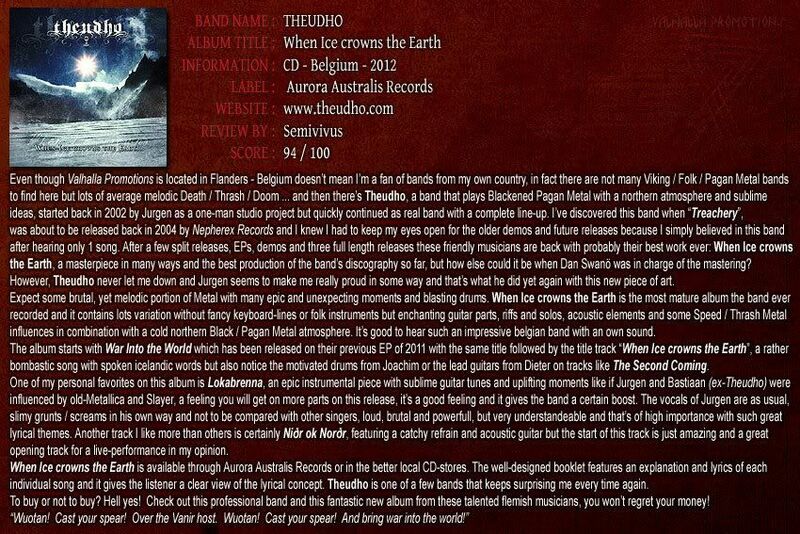 "When Ice Crowns the Earth", is the fourth full-length album of THEUDHO. With a more guitar driven sound, more diverse songwriting, a technical precise execution of the music and a better production, THEUDHO deliver us their best album to date. From the thrashing madness of "War into the World" to the haunting darkness of "Niðr ok Norð" over the eerie "Lokabrenna" to the blasting aggression of "The Straw Death" and everything in between, there is no doubt that THEUDHO has reached a new peak. Recorded and mixed at Þrúðvangr, Flanders / Belgium between October 2010 and July 2011. Mastered by Dan Swanö at Unisound, Sweden. Artwork and layout by Jurgen.